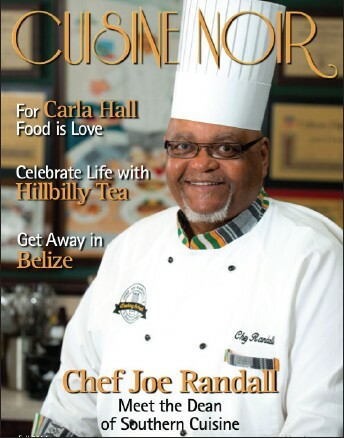 Savannah’s own Chef Joe Randall, of Chef Joe Randall’s Cooking School and author of A Taste of Heritage: The New African-American Cuisine, is rightfully a ‘cover man’ while featured as the fall cover story by Cuisine Noir Magazine. Through his tireless fifty-year dedication to the culinary industry, Chef Randall is openly humbled by this honor, “I have been enjoying an exciting culinary career and have been featured as a cover story before, but to be featured by Cuisine Noir – my peer set – this honor means so much more,” said Randall. Deemed the “Dean of Southern Cuisine” by Cuisine Noir, Chef Joe was born in McKeesport, PA., and raised in Harrisburg, PA., while it was his uncle, Pittsburgh restaurateur and caterer Richard L. Ross, who inspired him to develop an interest in Southern cooking. Since his early years of training with Ross, Randall has received many awards and commendations for his contributions to the preservation and advancement of Southern cooking and has appeared in many national cooking shows, including The Food Channel, HGTV and more. “I know that my culinary mentors like Robert W. Lee and Edna Lewis rest easy knowing that I am actively working to preach the gospel of authentic Southern cooking through accolades like feature stories from Cuisine Noir, a publication with an audience that represents tomorrow’s culinary leaders,” said Randall. To learn more about Chef Joe Randall and what he’s cooking up in Savannah, check out his calendar of classes and recipes at www.chefjoerandall.com.